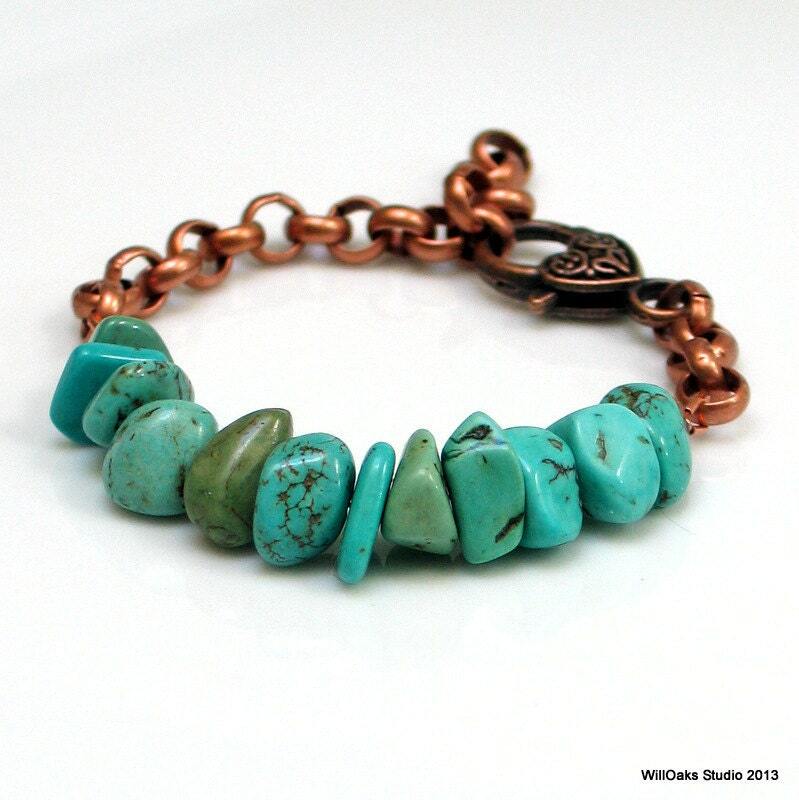 A turquoise bracelet with bold rollo chain in either copper or antique silver finished designed and hand made here in Woodstock with beautiful organic nuggets of blue green stone. 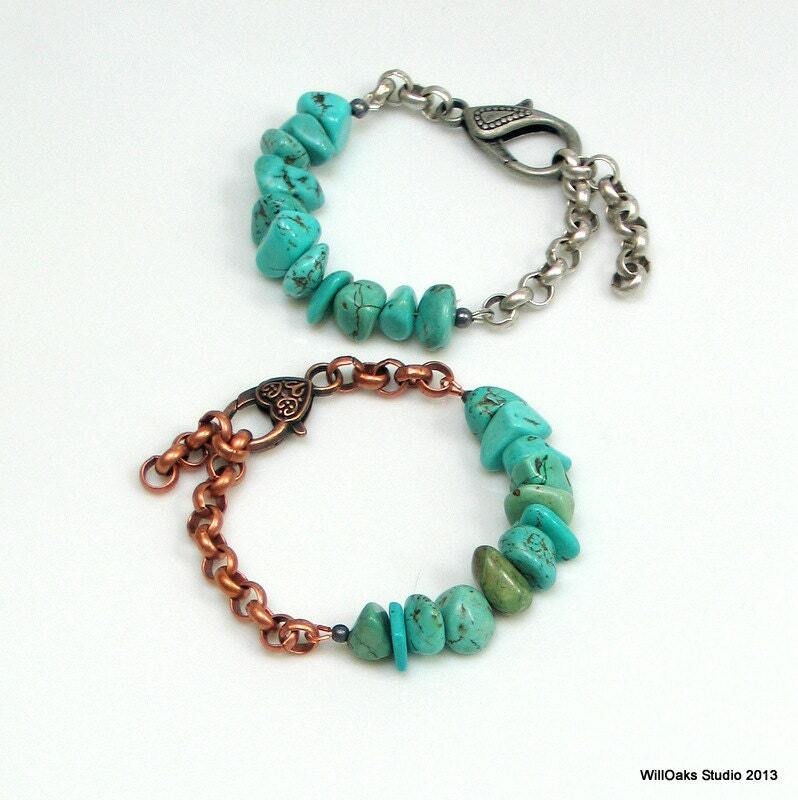 Made to be worn alone or stacked with other bracelets, just beautiful to wear all year round. Darker blue green magnesite, dyed and stabilized, on heavy nylon coated steel bead cable, is linked to larger rollo chain. 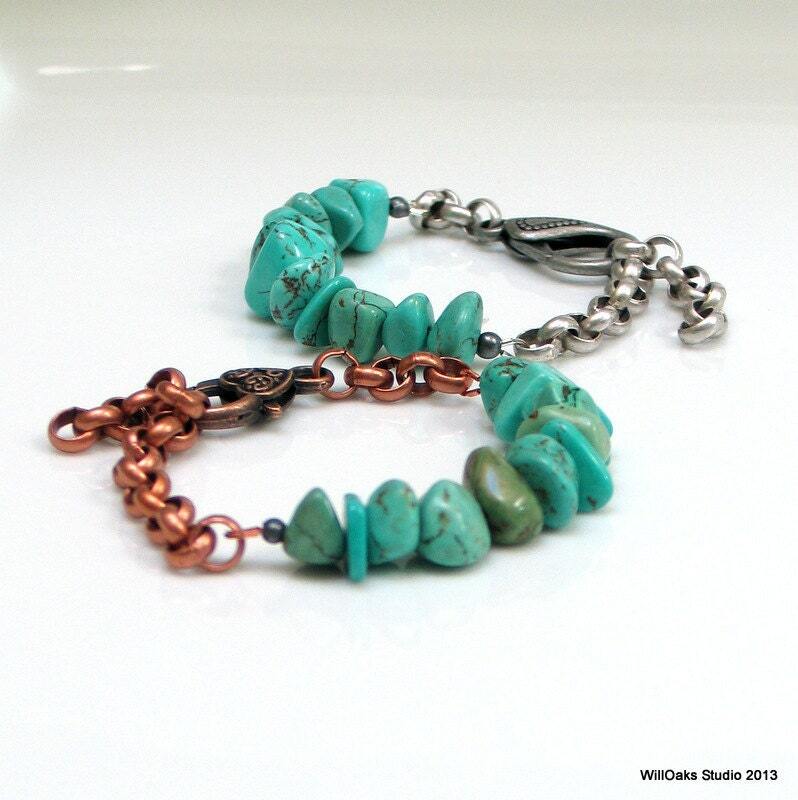 About 3" of carefully arranged stones created this organic looking focal for the bracelet. Closes with an oversized decorative designer lobster clasp that can be hooked from as large as 8" to as small as 5 1/2". 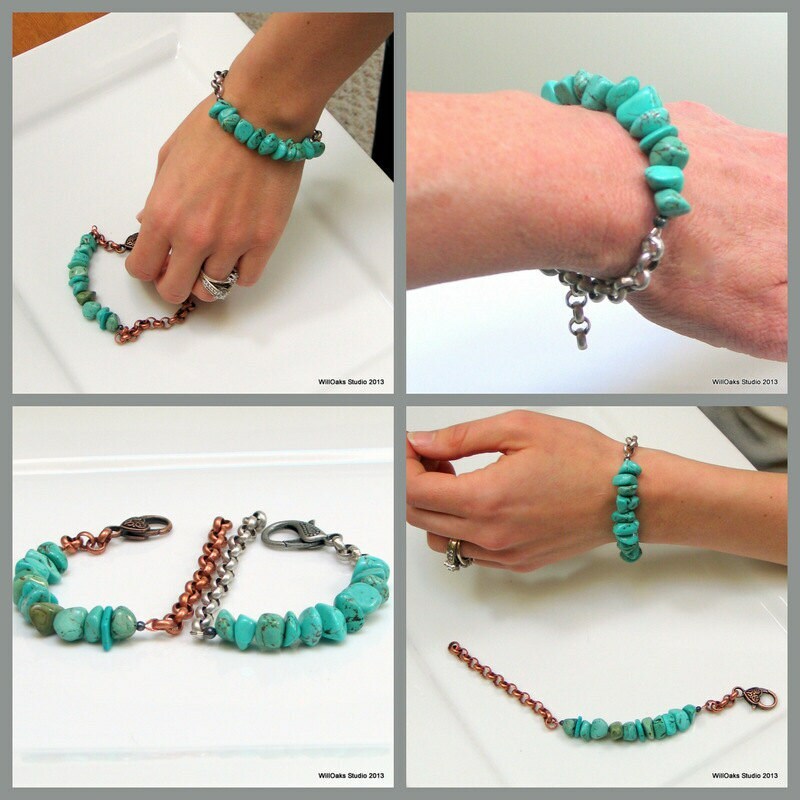 Copper or Silver plated brass chain is hefty as is the larger clasp to work as a counter point and a counter balance to the row of nuggets--a feature in my series of casual stone and chain bracelets. These bracelets puts the focus on natural stones, especially irregular shapes and sizes as are found in nature, to celebrate the beauty in our natural world. Due to the organic nature of the stone materials, each piece will be a little different. 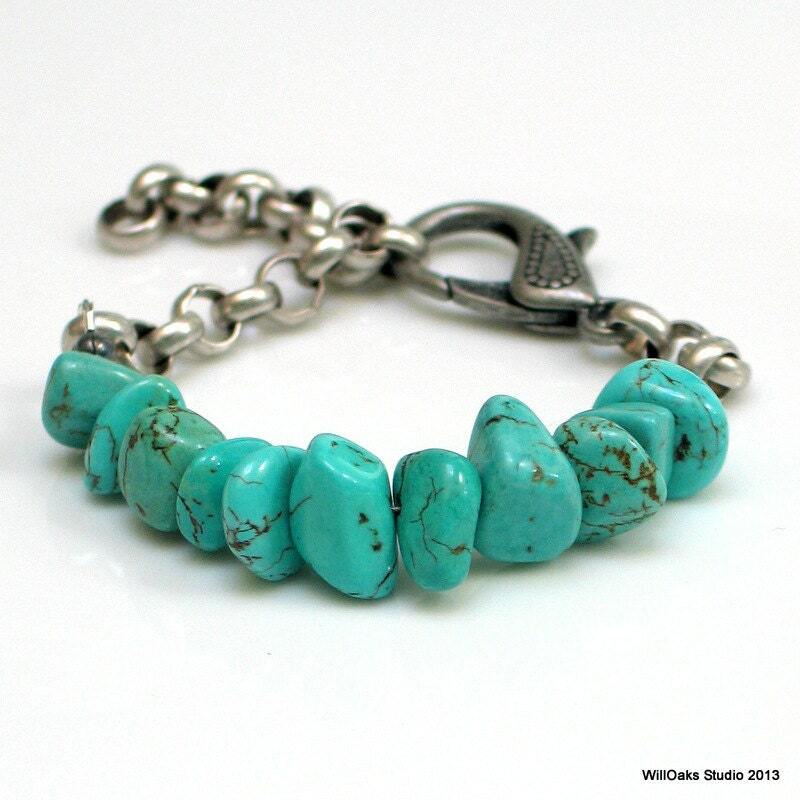 These turquoise nuggets measure, on average, 10 to 15 mm in diameter and are of varied thickness, as can be seen in the photos. I chose to use metals with antique finishes to add a feeling of age to this design. My "Stacked Stones" series is inspired by natural stones such as those found hiking, rock climbing, mountain climbing, beach combing, or as seen in rock cairns, rock gardens, and natural stone architecture. Natural nuggets and organic shapes are dominant in my compositions and where possible, natural materials and colors are featured. As my series took shape, I created bracelets, necklaces and earrings all sharing this design feature of "stacked stones."